Croton caudatus Geiseler is widely used in the northeast region of India to treat several diseases in humans. The aim of the present study was to investigate the phytochemical basis of its medicinal use. The dried powder of mature leaves of Croton caudatus was sequentially extracted in petroleum ether, chloroform, ethyl alcohol and water using standard protocols. The ethanol and water extraction of leaves resulted in 4.14% and 5.9% extractive values, whereas drying of leaves led to a loss of 20% water with approximately 6.35% acid and 5.95% water soluble ash contents. The qualitative phytochemical analysis of the chloroform, ethanol and aqueous extracts of Croton caudatus was carried out using standard protocols. These three extracts were analyzed using thin layer chromatography (TLC). The qualitative phytochemical analysis revealed that Croton caudatus leaves contained alkaloids, phytosterols, saponins, phlobatannins, cardiac glycosides, flavonoids, phenolics and terpenoids. However, tannins were conspicuous by their absence. The TLC profiling revealed presence of different chemical constituents indicated by different Rf values of various TLC spots in numerous solvent systems. The present study indicates that the medicinal value of Croton caudatus lies in the presence of different metabolites like alkaloids, phytosterols, saponins, phlobatannins, cardiac glycosides, flavonoids, phenolics and terpenoids, which have been reported to possess diverse medicinal properties. Croton caudatus, Alkaloids, Phytosterols, Saponins, Phlobatannins, Cardiac glycosides and Flavonoids. The earliest written record of use of plants as medicine can be found in the old Hindu scripture, the Rig Veda, which dates back to 3500 B.C. to 1800 B.C. The other main classical texts that provide a detailed description of over 700 herbs and their uses in healthcare in the form of different medicines include Atharvaveda (1200 BC), Charak Samhita and Shusrut Samhita (1000- 500 BC). The earliest known written medical prescription of herbs as remedies to treat various illnesses is about four thousand years old and can be found in Sumerian clay tablets. This has been the time when mandrake plant was prescribed for pain relief, turmeric for blood clotting, roots of the endive plant for the treatment of gall bladder disorders, whereas raw garlic for circulatory disorders. The use of alternative and complementary medicine received a fillip when WHO recognized these systems as one of the methods of human healthcare in the first decade of this century. The popularity of herbal medicines has been increasing worldwide due to the growing recognition that natural products are less toxic and do not possess any known side effects than the synthetic drugs, which may be due to their biologic origin. The use of plants as a source in modern medicine was recognized in early 19th century, which had resulted in the isolation of morphine from opium. Since then several compounds have been isolated from natural or plant products for human healthcare. Isolation and characterization of pharmacologically active compounds from medicinal plants continue till today in the hope to search better non-toxic medicines and cure for various health disorders in humans. This has resulted in the application of state of art techniques to standardize the herbal medicines and isolate bioactive molecules that can serve as analytical markers. The success of drug discovery from plant sources has resulted principally in the development of anticancer and antibacterial agents. The Croton caudatus Geiseler (family Euphorbiaceae) has been traditionally used to treat several human health disorders. It is used as a poultice to treat fever and sprains in various parts of Asia. It is also used to treat liver diseases. The roots of Croton caudatus are purgative and its roots, stems or leaves are used individually or even the whole plant is also used for medicinal purpose owing to low toxicity. Croton caudatus is fairly widespread in South East Asia and it is found in Sri Lanka, Bhutan, Borneo, Burma, Indo-Myanmar region, Java, Laos, Malaysia, Nepal, Pakistan, Philippines, Singapore, Sumatra, Thailand and Vietnam. The Chin-Kuki, inhabitants of Manipur and Mizoram have used Croton caudatus Geiseler for healthcare since long. It has been used as a traditional Dai Nationalistic medicine, where its stems and leaves have been used for the treatment of malaria, ardent fever, convulsions, rheumatic arthritis, and numbness. It is one of the constituents in Qi Wei Ke Teng Zi Wan, which is a famous formula used by the Dai nationality of China for the treatment of pain and stomach diseases. The leaves have been applied on festering wounds of injured cattles to ward off against the maggots. In Hmar language, it is called as “Ranlung damdawi”(Ranlung=Worm, damdawi=medicine), in Manipuri language “Yong Khullokpi and Khagilaikoi” and in Thadou-Kuki “Ganthan lou”. The oral administration of the juice/extract from leaves has been first experimented at Saikot, Churachandpur district of Manipur by Mr. Chawilen on himself, therefore it is also known as “Chawilen damdawi (medicine)” after him and it is traditionally known as “Kam-Sabut”. It usually grows in peat swamp, deciduous and thick canopy evergreen forests. Sometimes, it grows near marginal areas along river or stream tracts. Owing to its widespread use in this part of India as a traditional medicine, the present study was undertaken to investigate the phytochemicals present in Croton caudatus in vitro. The mature and non-infected leaves of Croton caudatus Geiseler (family Euphorbiaceae) were collected from Saikot, Churachandpur District of Manipur during the dry season. The plant was identified by Professor Kumar Singh, a well-known taxonomist of Manipur University, Imphal, India and it was further authenticated by the Botanical Survey of India, Shillong. The cleaned and non-infected leaves were spread in the stainless steel trays and allowed to shade dry at room temperature in dark in clean and hygienic conditions to avoid entry of insects, animals, fungus, and extraneous terrestrial materials. The exhaust and free air circulation was allowed. The dried leaves were powdered in a grinder at room temperature. A sample of 100 g of leaf powder was extracted sequentially with petroleum ether, chloroform, ethanol and water in a Soxhlet apparatus. The extract was then concentrated to dryness under reduced pressure and stored at -80°C until further use. An approximate yield of 26% was obtained. Ash values: The ash values including total and acid insoluble ash were determined to estimate the total amount of the inorganic salts present in the drug. The ash contents remained after ignition of plant material was determined by two different methods to measure total and acid insoluble ash contents. Total ash: The method measures the total amount of material remaining after ignition including both ‘physiological ash’, derived from the plant tissue itself, and ‘non-physiological ash’ which is the residue of the extraneous matter (e.g. sand and soil) adhering to the plant surface. Procedure: Two grams of ground air-dried material of Croton caudatus was accurately weighed in a previously ignited and tared crucible. The material was spread as an even layer and ignited by gradually increasing the temperature up to 500-600°C until it became white, indicating the absence of carbon. The crucible was cooled and weighed. The percentage of total ash content was calculated according to the following formula. Acid insoluble ash: The residue obtained after boiling the total ash was diluted with hydrochloric acid, and ignited. The insoluble matter remaining after ignition was measured as the presence of silica. W=Total weight of powdered plant material. Extractive values: These are used to determine the amount of the matter which is soluble in the solvents used including alcohol and water. The percentage of alcohol and water-soluble extractives were calculated and used as standards. Procedure: Five grams of air dried coarsely powdered material was macerated in 100 ml of alcohol in a closed conical flask for twenty four hours, with frequent shaking during first six hours and allowed to stand for next eighteen hours thereafter it was filtered rapidly with caution to avoid loss of solvent and 25 ml of the filtrate was evaporated to dryness at 105˚C in a tared flatbottomed shallow dish and weighed. The percentage of alcohol-soluble extractive was calculated with reference to the air-dried material. Procedure: Five grams of coarsely powdered air dried material was macerated in 100 ml of chloroform-water (0.1%) in a closed flask for 24 h, with frequent shaking until six hours and allowed to stand for another eighteen hours. Thereafter it was filtered rapidly, with precautions to avoid loss of solvent by evaporation and 25 ml of the filtrate was evaporated to dryness at 105˚C in a tared flat-bottomed shallow dish and weighed. The percentage of water soluble extractive was calculated with reference to the air dried material. All the tests were done in triplicate. Phytochemical Screening: Phytochemical screening of different extracts was carried out for the presence of various phytochemicals using standard procedures described below. Alkaloids: 0.5 g of extract was dissolved in 10 ml of acidified alcohol, boiled and filtered and to the 5 ml of filtrate, 2 ml of dilute ammonia was added followed by the addition of 5 ml of chloroform. The mixture was shaken gently to extract the alkaloidal base. The chloroform layer was further extracted with 10 ml of acetic acid and divided into two parts. One part was mixed with Mayer’s reagent, whereas the other part was mixed with Draggendorff’s reagent. The formation of a creamy (Mayer’s reagent) or reddish brown precipitate (Draggendorff’s reagent) indicated the presence of alkaloids[10,11]. Similarly, to other two tubes Hager’s and Wagner’s reagents were added and the appearance of the yellow and brown precipitates indicated the presence of alkaloids in the ethanol extract of Croton caudatus. About 0.5 g of dried powdered samples was boiled in 20 ml of water in a test tube and filtered. A few drops of 0.1% ferric chloride was added to the filtrate. The formation of brownish green or a blue-black colour indicated the presence of tannins[10,11]. The aqueous extract of Croton caudatus was boiled with 1% aqueous hydrochloric acid and deposition of a red precipitate indicated the presence of phlobatannins[10,11]. Frothing: 3 ml of filtrate was diluted up to 10 ml with distilled water and shaken vigorously for 2 minutes. The formation of a fairly stable froth indicated the presence of saponins in the filtrate. Emulsification: 3 ml of above filtrate was diluted to 10 ml by adding 7 ml distilled water, mixed with 3 drops of olive oil and shaken vigorously for a few minutes. The formation of a fairly stable emulsion indicated the presence of saponins[10-12]. The presence of flavonoids was determined in all the extracts using three different methods[10,11,13]. 5 ml of dilute ammonia solution was added to a portion of the aqueous filtrate of each extract followed by the addition of a concentrated H2SO4. Appearance of a yellow colour (disappeared on standing) in each extract indicated the presence of flavonoids. A few drops of 1% aluminum solution were added to a portion of each filtrate. A yellow colour indicated the presence of flavonoids. A portion of the each plant powder was heated with 10 ml of ethyl acetate over a steam bath for 3 min. The mixture was filtered and 4 ml of the filtrate was shaken with 1 ml of dilute ammonia solution. A yellow colour indicated the presence of flavonoids. The presence of steroids was determined by adding 2 ml of acetic anhydride into 0.5 g ethanol extract of Croton caudatus followed by the addition of 2 ml sulphuric acid. The change from violet to blue colour or green colour in some samples indicated the presence of steroids[10,11]. Four milligrams of plant extract was treated with 0.5 ml of acetic anhydride and 0.5 ml of chloroform, followed by the slow addition of concentrated sulphuric acid. The development of red violet or blue colour indicated the presence of terpenoids[10,11]. Salkowski test : Five ml of each extract was mixed with 2 ml chloroform, with a careful overlaying of 3 ml concentrated sulphuric acid. The formation of a reddish brown precipitate at the interface indicated the presence of terpenoids. Usually 5 ml of each extract was treated with 2 ml of glacial acetic acid containing one drop of ferric chloride solution with an under laying of 1 ml of concentrated sulphuric acid. The appearance of brown ring at the interface indicated the presence of deoxysugar, which is a characteristic of cardenolides[10,11]. Alkaloids : 5 g of the leaf powder of Croton caudatus was weighed into a 250 ml beaker and 200 ml of 10% acetic acid in ethanol was added. The flask was covered and allowed to stand for 4 h and filtered. The filtrate was concentrated on a water bath to one-quarter of the original volume and to this concentrated ammonium hydroxide was added drop wise until complete precipitation. The whole solution was allowed to settle and the precipitate was collected and washed with dilute ammonium hydroxide and filtered. The residue contained the alkaloids, which was dried and weighed. Flavonoids: 10 g of the leaf powder of Croton caudatus was extracted repeatedly with 100 ml of 80% aqueous methanol at room temperature. The whole solution was filtered through Whatman filter paper No 42 (125 mm). The filtrate was later transferred into a crucible and evaporated to dryness over a water bath and weighed. TLC Analysis: TLC is a simple and rapid technique that is able to determine the number of components present in solution and helps in finding a suitable solvent for separating the components by column chromatography as well as for monitoring reactions progress. The ethanol extract was spotted on to a number of TLC plates (Merck India, Kolkata) in 1 mm diameter above the bottom of the plates and placed into different mobile phases. The extracts were allowed to move on the adsorbent (Stationary) phase according to the solvent system used. Several combinations of solvents of increasing polarity were evaluated as mobile phase for TLC run to determine the number of compounds present in different extracts of Croton caudatus. The different solvent systems were used as mobile phase for TLC, which consisted of n-hexane (n HX):ethyl acetate(EtOAc) (7:3), hexane:ethyl acetate (9:1), benzene (C6H6):acetone (Me2CO) (9.5:0.5), chloroform (CHCl3):methanol (MeOH) (3:2), dichloromethane (DCM):methanol (MeOH) (8:2), dichloromethane (DCM)/methanol (MeOH) (9:1):chloroform:methanol: Acetic acid (3:1.5:0.5), chloroform:ethyl acetate (9:1), petroleum ether:ethyl acetate (3:2), toluene:chloroform (3:2). The measure of the distance a compound traveled is considered as the Rf value. In each case the spots were visualized under UV light. The results of phytochemical analyses of Croton caudatus are presented in Tables 1-5 and Figures 1-4. Table 1: The percentage of loss on drying the fresh leaves of Croton caudatus. Table 2: Physicochemical parameters of dried leaves powder of Croton caudatus. Table 3: Yield of various extracts of dried leaves powder of Croton caudatus. Table 4: Results of the Phytochemical analysis of Croton caudatus leaves. Table 5: Quantitative determination of the alkaloid and flavonoid contents in Croton caudatus. Figure 1. Phytochemical profile of various leaf extract of Croton caudatus extracts (CCE). Figure 2. TLC profile of chloroform leaf extract of Croton caudatus by using various solvents system. Figure 3. 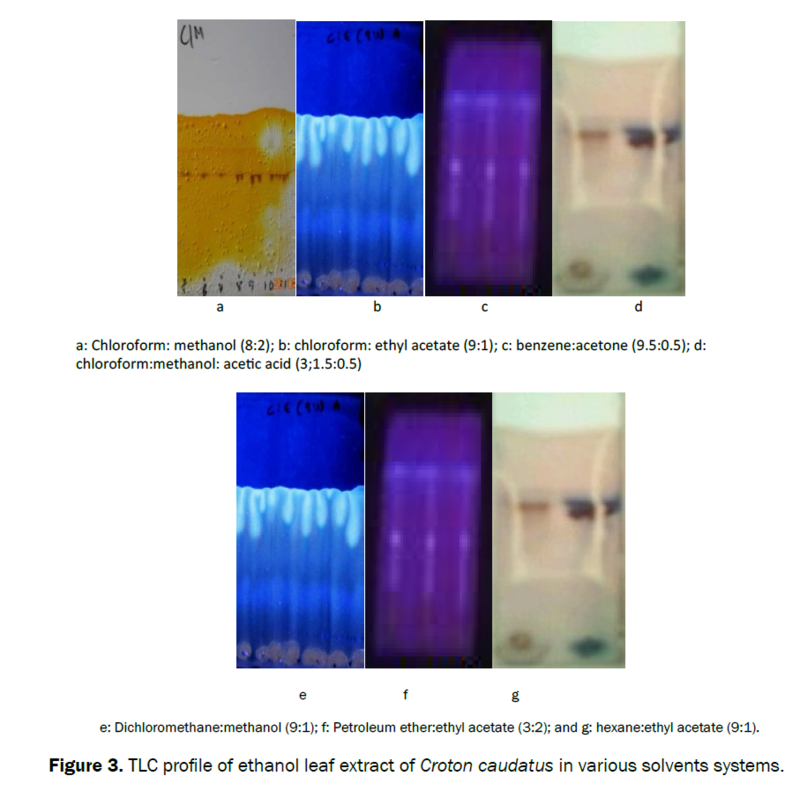 TLC profile of ethanol leaf extract of Croton caudatus in various solvents systems. Figure 4. TLC profile of aqueous leaf extract of Croton caudatus in different using solvents systems. The drying of 25 kg of Croton caudatus leaves yielded 20 kg of dried leaves, and this reduction in weight was due to ≈ 20% loss of its water contents (Table 1). The analysis of dried leaves of Croton caudatus showed presence of 9.6% moisture; 11.65% total ash; 6.3% acid-insoluble ash; 5.95% water-insoluble ash. The Croton caudatus leaves contained 4.144% ethanol-soluble and 14.856% water-soluble extractives, respectively (Table 2). The extraction of 10 kg of dried leaf powder yielded 676 g of chloroform extract, 750 g of ethanol extract and 800 g of aqueous extract respectively (Table 3). The preliminary phytochemical screening of different extracts of Croton caudatus showed the presence of alkaloids, phytosterols, saponins, phlobatannins, cardiac glycosides flavonoids, phenolics and terpenoids as chemical entities, whereas tannins were completely absent (Table 4 and Figure 1). The quantitative determination of the chemical constituents showed that Croton caudatus contained 0.136% ± 0.1 alkaloids and 0.32% and flavonoids, respectively (Table 5). The evaluation of various extracts of Croton caudatus showed the presence of different phytochemical components as indicated by a varying number of spots on a TLC plates and the different distances traveled by them (Rf values) in numerous solvent systems. The TLC profiles of all extracts of Croton caudatus are presented in (Figures 2-4). The plants are able to synthesize various complex molecules for their nutrition, stress combat, defense and as the byproduct of metabolism. These molecules are useful as remedies for various human diseases. The analysis of phytochemistry of plants plays an important role in drug development and also in combinatorial chemistry for new drug discovery. The presence of different phytochemicals or pharmacophores makes plants as an important source of medicine for the treatment of various human ailments. The plants usually contain various phytochemicals including alkaloids, tannins, flavonoids and other polyphenolic compounds, which are known to exert a definite physiological and biochemical action in the humans after their administration. The plants containing alkaloids have played a key role in the treatment of human diseases since the advent of human history. The alkaloids derived from plant have been used to treat cancer in the modern medicine. Croton caudatus contained 0.14% alkaloid contents in it and its traditional use to treat cancer may be due to the presence of alkaloids. The alkaloids possess a diverse array of medicinal activities and some of the plant derived alkaloids including the vinca alkaloids, taxens, podophyllotoxins, camptothecins etc. are used to treat different cancers in humans in modern medicine[16,17]. The other alkaloids like cocaine and morphine are used as local anesthetics, stimulants and pain reliever[18,19]. Similarly, caffeine, nicotine, and antimalarial drug quinine also act as stimulants[20-22]. The saponins are a class of triterpinoids found in several plants and mainly consist of aglycone, designated genin or sapogenin, covalently linked to one or more sugar moieties. The presence of saponins has been confirmed in Croton caudatus in this investigation. The saponins are produced by plants mainly as a defence weapon against pathogens and herbivores and they have been attributed to possess different biological activities including fungicidal, insecticidal, allelopathic and molluscicidal[23-25]. The saponins have been also found to possess immunoadjuavant, antibacterial, antifungal, antiviral, antiprotozoal, antioxidant, anticarcinogenic immunostimulatory, hypoglycemic, hemolytic and membrane permeabilizing activities[26-30]. Saponins have been found to inhibit angiogenesis and exert anticancer activity by inhibiting the cell cycle and inducing apoptosis in cultured cell lines. The use of Croton caudatus as a medicine to treat certain disorders and its claimed anticancer effect may be due to the presence of saponins. The presence of 0.32% flavonoids indicates that Croton caudatus is rich in them and the anticancer and wound healing activities traditionally attributed to it may be due to the presence of flavonoids. This contention is supported by earlier observations where flavonoids have been reported to possess antimicrobial, antifungal, anticancer, antidiarrheal, antiinflammatory, antithrombogenic, antiosteoporotic, antiviral and radioprotective activities[32-39]. Flavonoids (both flavones and flavanols) have been reported to act as antioxidants[32,40]. The flavonoids also act on enzyme systems critically involved in the initiation and maintenance of the inflammatory response. Flavonoids have been reported to inhibit acetyltransferase (AT) and phospholipase A2 (PL2) activities[41-43]. Flavonoids have been found to retard platelet function and gene expression of EC adhesion protein[44.45]. Flavonoids have been reported to protect against the development of atherosclerosis[46,47]. All the activities listed above for flavonoid support the medicinal activity of Croton cadautus. The phytosterols are one of the main constituents of Croton caudatus and it is traditional used to relieve pain in humans. The phytosterols have been reported to exert antineoplastic, antiinflammatory and pain relieving activities[48-50] support the traditional use of Croton caudatus in relieving pain. The hypoglycemic, hypocholesterolemic and hormones like activities of phytosterols humans have been reported in humans[51-52]. Steroids have been used as antiinflammatory and analgesic agents in modern clinical studies. Phytosteroles have been also found to be active against obesity and atherosclerosis[54,55]. The confirmation of the presence of cardiac glycosides in Croton caudatus indicates that its traditional use as an anticancer agent in humans could be due to the presence of cardiac glycosides, since cardiac glycosides have been found to exert anticancer effect as early as 1967. The recent studies indicate that cardiac glycosides exert cytotoxic effect in HT29, HCT116, and CC2 colon cancer cell lines. Likewise, cardiac glycosides have shown activity against a wide variety of cancers including breast, prostate, melanoma, pancreatic and lung cancers, and leukaemia, neuroblastoma and renal adenocarcinoma. Apart from cancer treatment cardiac glycosides have been used to treat cardiac disorders like heart failure and atrial arrhythmia, where they act by inhibiting Na+/K+-ATPase. The clinical trials indicate that the administration of the cardiac glycosides, digoxin along with chemotherapy had a positive impact on overall survival in cohorts of breast, colorectal, head and neck, and hepatocellular carcinoma patients. Traditionally, Croton caudatus Geiseler var. tomentosus have been used to treat malaria, ardent fever, convulsions, rheumatic arthritis, and numbness. The leaves are also given to kill the sore-worms for pigs and cattle. Further investigations on the chemical constituents of this species have now led to the isolation of a new flavone 1, along with nine known ones. The presence of various phytochemicals including alkaloids, phytosterols, saponins, phlobatannins, cardiac glycosides, flavonoids, phenolics and terpenoids, may be responsible for the various medicinal activities of Croton caudatus, which is used to treat several health disorders traditionally. Phytochemical analysis and TLC profiling of various extracts of Croton caudatus revealed that it contains alkaloids, phytosterols, saponins, phlobatannins, cardiac glycosides, flavonoids, phenolics and terpenoids and the medicinal activity of this plant may be due to the presence of one or more of these phytochemicals or also due to the concerted action of all these pharmacophores. The authors are thankful to the University Grants Commission for financial support vide Grant Nos. F.4-3/2007(BSR)/11- 116/2008(BSR), and F.4-10/2010(BSR) and Department of Biotechnology vide Grant No. BT/60/NE/TBP/2011), Government of India, New Delhi to carry out this study. Dash B and Sharma BK. (2001) CharakSamhita. Chaukhamba Sanskrit Series Office, Varanasi, India. Kong JM et al. Recent advances in traditional plant drugs and orchids. ActaPharmacol Sin. (2003);24:7-21. World Health Organization. (2002) Traditional medicine strategy 2002-2005 (Geneva: WHO, 2002). Douglas Kinghorn A. Pharmacognosy in the 21st century. J Pharm Pharmacol. (2001);53:135-148. Cragg GM and Newman DJ. Natural products: a continuing source of novel drug leads. BiochimBiophysActa. (2013);1830:3670-3695. Lin Y et al. Medicine Colorful Illustrations. Yunnan Nationality Press, Kunming.Medicine; Shanghai Science and Technology Press: Shanghai, China, (2003);447. Jiangsu New Medical College Dictionary of Traditional Chinese Medicine,Shanghai Science and Technology Press: Shanghai, China, (1975);447. Pharmacopoeia Commission of People’s Republic of China. Pharmacopoeia of the Peoples Republic of China; Chemical Industry Press: Beijing, China, (2005);1:306. Suffness M andDouros J. (1979) Drugs of plant origin. In Methods in cancer Research. ED, De Vita VT. Vol: 16, New York, USA 73-94. Doughari JH. (2012) Phytochemicals: extraction methods, basic structures and mode of action as potential chemotherapeutic agents, phytochemicals - A global perspective of their role in nutrition and health.Dr. VenketeshwerRao (Ed. ), InTech, Rijeka, Croatia. Trease GE and Evans WC. (1989) Pharmacognsy. 11th edBrailliarTiridel Can. McMillian publishers. Sofowara A. (1993) Medicinal plants and Traditional medicine in Africa. Spectrum Books Ltd, Ibadan, Nigeria.289. Boham BA and Kocipai-Abyazan R. Flavonoids and condensed tannins from leaves of Hawaiian Vacciniumvaticulatum and V. calycinium. Pacific Sci.(1974);48:458-463. Hill AF. (1952) Economic Botany. A textbook of useful plants and plant products(2ndedn). McGraw-Hill Book Company Inc, New York. Nicolaou KCet al. Total synthesis of taxol. Nature. (1994);367:630-634. Moudi M, Go R, Yien CY, Nazre M. (2013) Vinca alkaloids. Int J Prev Med 4: 1231-1235. Rothman RB et al. Amphetamine-type central nervous system stimulants release norepinephrine more potently than they release dopamine and serotonin.Synapse. (2001);39:32-41. Karamese M et al. The Comparison of Intrathecal Morphine and IV Morphine PCA on Pain Control, Patient Satisfaction, Morphine Consumption, and Adverse Effects in Patients Undergoing Reduction Mammoplasty.Plasty. (2015);15:e15. Dani JA and Bertrand D.Nicotinic acetylcholine receptors and nicotinic cholinergic mechanisms of the central nervous system. Annu Rev PharmacolToxicol. (2007);47:699-729. Thompson AJ and Lummis SC. Antimalarial drugs inhibit human 5-HT(3) and GABA(A) but not GABA(C) receptors.Br J Pharmacol. (2008);153:1686-1696. Persad LA. Energy drinks and the neurophysiological impact of caffeine. Front Neurosci. (2011);5:116. Aladesanmi AJ.Tetrapleuratetraptera: molluscicidal activity and chemical constituents. Afr J Tradit Complement Altern Med. (2006);4:23-36. Sung WS and Lee DG. In vitro candidacidal action of Korean red ginseng saponins against Candida albicans. Biol Pharm Bull. (2008);31:139-142. Nielsen JK et al.Resistance in the plant, Barbarea vulgaris, and counter-adaptations in flea beetles mediated by saponins.J Chem Ecol. (2010);36:277-285. Nagata T et al. Camellidins, antifungal saponins isolated from Camellia japonica. Agricultural Biological Chemistry. (1985);49:1181. Woldemichael GM and Wink M.Identification and biological activities of triterpenoidsaponins from Chenopodium quinoa.J Agric Food Chem. (2001);49:2327-2332. Tsuzuki JK et al. Antifungal activity of the extracts and saponins from Sapindussaponaria L.An Acad Bras Cienc. (2007);79:577-583. Khatuntseva EA et al. Triterpenoidsaponins from the roots of Acanthophyllumgypsophiloides Regel. Beilstein J Org Chem. (2012);8:763-775. Khan AAMM, Naqvi TS and Naqvi MS.Identification of Phytosaponins as Novel Biodynamic Agents: An Updated Overview Asian J ExpBiol Sci. (2012);3:459-467. Man S et al.Chemical study and medical application of saponins as anti-cancer agents. Fitoterapia. (2010);81:703-714. Nijveldt RJ et al. Flavonoids: a review of probable mechanisms of action and potential applications. Am J ClinNutr. (2001);74:418-425. Jagetia GC and Reddy TK.The grapefruit flavanonenaringin protects against the radiation-induced genomic instability in the mice bone marrow: a micronucleus study. Mutat Res. (2002);519:37-48. Jagetia GC and Reddy TK.Modulation of radiation-induced alteration in the antioxidant status of mice by naringin. Life Sci. (2005);77:780-794. Jagetia GC, Venkatesha VA and Reddy T. Naringin, a citrus flavonone, protects against radiation-induced chromosome damage in mouse bone marrow.Mutagenesis. (2003);18:337-343. Jagetia GC and Venkatesha VA.Effect of mangiferin on radiation-induced micronucleus formation in cultured human peripheral blood lymphocytes.Environ Mol Mutagen. (2005);46:12-21. Schuier M et al.Cocoa-related flavonoids inhibit CFTR-mediated chloride transport across T84 human colon epithelia.J Nutr. (2005);135:2320-2325. Cushnie TP and Lamb AJ.Antimicrobial activity of flavonoids.Int J Antimicrob Agents. (2005);26:343-356. Cushnie TP and Lamb AJ. Recent advances in understanding the antibacterial properties of flavonoids.Int J Antimicrob Agents. (2011);38:99-107. Bagchi M et al.Acute and chronic stress-induced oxidative gastrointestinal injury in rats, and the protective ability of a novel grape seed proanthocyanidin extract. Nutrition Researc. (1999);19:1189–1199. Yanoshita Ret al.Inhibition of lysoPAFacetyltransferase activity by flavonoids. Inflamm Res. (1996);45:546-549. Lindahl M and Tagesson C. Flavonoids as phospholipase A2 inhibitors: importance of their structure for selective inhibition of group II phospholipase A2.Inflammation. (1997);21:347-356. Manthey JA, Grohmann K and Guthrie N.Biological properties of citrus flavonoids pertaining to cancer and inflammation.Curr Med Chem. (2001);8:135-153. Freedman JE et al.Select flavonoids and whole juice from purple grapes inhibit platelet function and enhance nitric oxide release.Circulation.(2001);103:2792-2798. Gerritsen ME et al.Flavonoids inhibit cytokine-induced endothelial cell adhesion protein gene expression.Am J Pathol. (1995);147:278-292. Koga T and Meydani M.Effect of plasma metabolites of (+)-catechin and quercetin on monocyte adhesion to human aortic endothelial cells.Am J ClinNutr. (2001);73:941-948. Siasos G et al.Flavonoids in atherosclerosis: an overview of their mechanisms of action.Curr Med Chem. (2013);20:2641-2660. Ongoka et al.Steroids isolated from Millettiaversicolor Baker (Fabaceae).African J Biotechnol. (2008);7:1727-1730. Woyengo TA, Ramprasath VR and Jones PJ.Anticancer effects of phytosterols. Eur J ClinNutr. (2009);63:813-820. Aldini R et al. Antiinflammatory effect of phytosterols in experimental murine colitis model: prevention, induction, remission study.PLoS One.(2014);9:e108112. Okwu DE. Evaluation of the chemical composition of indigenous spices and flavouring agents. Global Journal of Pure and Applied Science. (2001);7:455-459. Marangoni F and Poli A.Phytosterols and cardiovascular health.Pharmacol Res. (2010);61:193-199. Singh AP.Short Review Distribution of Steroid like Compounds in Plant Flora. Pharmacognosy Magazine. (2006);2:87-89. Schonfeld G.Plant sterols in atherosclerosis prevention. Am J ClinNutr. (2010);92:3-4. Furlan CPB et al.Conjugated linoleic acid and phytosterols counteract obesity induced by high-fat diet. Food Res Int. (2013);51:429–435. Felth J et al. Cytotoxic effects of cardiac glycosides in colon cancer cells, alone and in combination with standard chemotherapeutic drugs.J Nat Prod. (2009);72:1969-1974. Prassas I and Diamandis EP.Novel therapeutic applications of cardiac glycosides.Nat Rev Drug Discov. (2008);7:926-935. Menger L et al.Cardiac glycosides exert anticancer effects by inducing immunogenic cell death.SciTransl Med. (2012);4:143ra99. Sawmliana M. (2003) The Book of Mizoram plants First ed. Lois Bet, Chandmari, Aizawl. Zou GA et al.Flavonoids from the stems of Croton caudatus Geisel. var. tomentosus Hook.Molecules. (2010);15:1097-1102.